When the Kickstarter backer exclusive gameplay debut for the spiritual successor to The Neverhood hit the web, developer Pencil Test Studios sent out a hi-res version to share with the class. 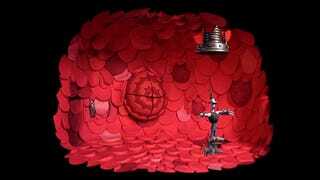 Here's our first look at Armikrog in action. Featuring the unmistakable art style of The Neverhood creator (and Earthworm Jim character designer) Doug TenNaple, Armikrog's gameplay is looking just as creative and delightful as its visuals. Recognize the voices of the main characters? The tall, skinny one is Michael J. Nelson of Mystery Science Theater 3000 and now RiffTrax fame, and Beak-Beak is veteran voice actor Rob Paulsen, who's voiced everything from Pinky from Pinky and the Brain to Raphael in the original Teenage Mutant Ninja Turtles cartoon. It's like they're making a game just for me. Actually they're just making Armikrog for Wii U, PlayStation 4 and PC operating systems. It's due out early-ish next year.